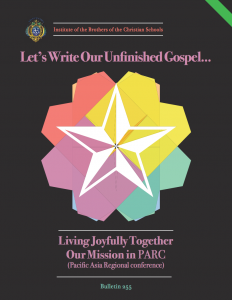 The Institute of the Brothers of the Christian Schools has released a new Bulletin, number 255, entitled “Let’s Write Our Unfinished Gospel… Living Joyfully Together Our Mission in PARC (Pacific Asian Regional Conference).” This latest Bulletin offers a glimpse of highlights the Superior General and General Council experienced during their visits in 2015 and 2016. It explores the diverse realities in PARC and offers “next practices,” new ways of doing things now with eyes to the future. PARC includes Australia, New Zealand, Pakistan and Papua New Guinea (District of ANZPPNG); Sri Lanka (District of Colombo); India (Delegation of India); Vietnam and Cambodia (District of Vietnam); and Hong Kong, Japan, Malaysia, Myanmar, Philippines, Singapore and Thailand (Lasallian East Asia District).